The AT&T Park loomed in a blanket of wet fog as the announcer broke the silence with his welcome announcement to the Spartan Stadium Sprint. 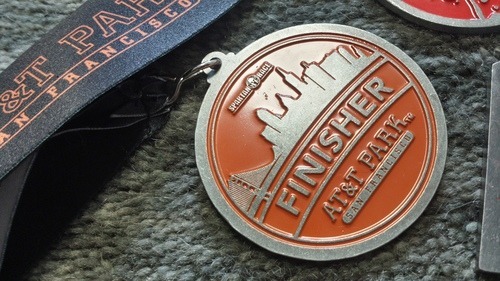 At 6:30 in the morning, there were two types of people walking the halls of AT&T Park, those who wanted to be sure they got a parking place and those preparing for the start of the elite heat. Those who arrived early based on parking were faced with a cold long wait for their heat to go off; however, those who were there for the elite heat were already getting stretched out, warmed up and were doing a little sizing up. Like any Spartan Race, shortly after the morning silence is broken, an energy emerges from the event grounds that is catchy. If you don’t catch this energy at bag check, then you surely will once you cross the starting line. In a stadium, this energy feels cramped and wild. Not only are the announcements loud and unsettling, so is the energy that is oozing out of every racer and spectator at the starting line. This energy was about to be released along with the first wave of elite racers – the elite men. These men adorned in more traditional running attire – many shirtless in Spartan fashion – huddled against the seemingly first obstacle of the race—a 6 ft wall that loomed as soon as they crossed the entrance check-point. Confusion was in the eyes of the racers at the front, as this 6 foot wall was about to be the bread to their individual jelly when the gun went off. Were they going to be trampled like the people at the front of a concert line? There was no room to move and when the doors opened, those “lucky” enough to be in the front were likely to regret it, or so it seemed. Thankfully, this wall was just a warm-up. The event staff instructed the racers to calmly scale this wall and proceed to what they indicated was the “real” starting line. Ahead laid white cords criss-crossing the ramps leading up to the upper levels of the stadium. It was obvious this was going to be a web and the racers were about to be tangled up in it. Once the elites were over the wall, the announcer said, “On your marks – GO.” The racers, bunched up and crowded, took off in a fury, releasing the energy they had been holding back, scurrying under and over the cords in their path on their way to victory, only to be stopped 100 yards up the ramp at was apparently the real start. Ha Ha. Nothing like getting the butterflies out of the way with a false start. Note: This false start and the spider web cords were removed for the general heat who were allowed to walk to the real starting line. The real start was done by breaking the pack into groups of 15 racers. This was done in order to control the congestion of the single track like running conditions the bleachers presented. 15 at a time, the racers stood on Spartan logos stuck to the floor ready for the race briefing. The announcer explained that many of the obstacles were to be done a set number of times and to be sure not to do any less – and then it was GO time. With a 10 second count down, 15 elite men charged the ramp. A few minutes later the next groups of 15 were brought forward, like those boarding an amusement park ride, and with a 10 second countdown, they were off. These elite racers barreled through the course, completing it in what would be amazing finishing times. The course snaked its way cleverly though AT&T Park, utilizing all portions of the park to collect over 3 miles of running course. Being a stadium sprint vs. a trail sprint, the hills were made up for by way of ramps and stairs – lots and lots of stairs. The race began with quick multi floor run up the switch back ramps generally used by patrons to leave the park. These ramps were made challenging by having cord strung back and forth across the ramps (Spiders Web). This forced runners to hop over them in sections or bear crawl under them. Runners were then lead to the upper levels of the stadium where they first hopped over a 4’ wall and then ran along the bleachers, then down, then across, then up, down, across, up, then … you get the point. Much of the running was loaded into this first section or running. After the running you were presented with a Spartan Sand Bell that you were to carry through the bleachers in the same method as the initial bleacher running. Men were given 40 lb bells and women were given 25 lb bells. Once you completed this section, you dropped your bell off and ran along the outside of the stadium to be met by a series of ropes and ankle bands lining the floor. This began theBattle Rope Jump Rope, where you placed the ankle bands on your ankles and used the battle ropes to perform 50 jumps of rope. Note: This marked the first difference between the elite heat and the general heat. During the elite heat, each racer was required to yell out their count and were closely watched by a volunteer to assure all 50 were done correctly. The general race was loosely monitored and left to each racer’s honesty. This held true for any obstacle requiring counting. Once the jump rope was completed an 8’ wall greeted the racers. Once this obstacle was conquered racers proceeded into the locker room where 25 Release Push-Ups were performed. Once on their way the racers proceeded to crawl under a wood spectator bridge and emerged on the field for the A Frame Cargo Net Climb. After a quick photo opportunity, the race continued through the rear gates to the Tyrolean Traverse Wall and the Monkey Bars before stopping at the first water station. After a quick sprint, a series of concrete cores (Atlas Lift) were waiting to be lifted from their resting spot to a new spot 20’ away. Following 5 quick burpees, the concrete core was to be returned to its starting point for the next racer. Rounding a turn led you to a volunteer who happily presented you with another ankle band. This band was to remain on your ankles as you jumped to the top of the outfield bleachers. Note: The elites were required to jump from the bottom of the bleacher to the top whereas the general racers jumped from bleacher to bleacher. The race continued on through the park in this fashion using every area except the grass field. Even an area by the entrance was used for the Herculean Hoist. The remaining obstacles came in pretty rapid order moving intelligently through the park. Medicine Ball Slams (15 lbs for women and 25 for men), Rope Climb (knots for women, no knots for men), a series of four 6’ walls, a Water Jug Carry(1 jug for women, 2 jugs for men) and finally 25 Box Jumps on the third base line just before the finish. In conclusion, this was an intelligently laid out course with obstacles heavy enough to balance the course between a runner’s course and a lifters course. The course definitely slowed the fast runners down with some heavy lifting but allowed them enough room to sprint in open areas. Racers who were predominately heavy lifters made up time with the lifting but found the sprinting not part of their arsenal. Overall this was a great first Spartan Race for anyone who entered. 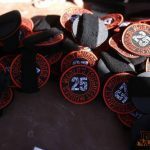 The lack of mud and gear selection made preparation for the race easy and the distance made it manageable for anyone looking to do their first OCR race – or first Spartan race. A Spartan Stadium Sprint is a highly recommended event, one that will begin ones addiction to OCR racing for a long time to come. Mike King is the owner of King’s Camps and Fitness. He teaches group fitness classes, an obstacle course training camp, and operates a youth obstacle fitness camp. On the weekends, Mike competes as an elite obstacle course racer (OCR) who travels around the United States to participate in select OCR events. After years of simply participating in OCR events, Mike is dedicated to taking what he’s learned and sharing his experiences with others so that they too can have fun and compete in OCR events.